"What a sun baked hamlet is Oodnadatta". Coote, E. H. Hell's Airport. 65. Coote and Taylor first arrived at this isolated township, about 1100 kilometres north west of Adelaide on 22/07/30 to refuel the Golden Quest and enjoy a quick snack and smoke, en route to Alice Springs. They had been in the air three hours from Marree, but the pilot thought the place had the best aerodrome between Adelaide and Alice Springs. Coote was to become familiar with the landing ground over the following months. Coote returned to Oodnadatta on 21/09/30, flying the allegedly re engined Golden Quest II to Central Australia, but was grounded for three days by gale force winds and dust storms. He wired the Company in Sydney and Colson in Alice Springs regarding the delay and received a, "veritable bombshell", reply from Colson. The expedition was returning from Illbilla without Lasseter and he suggested Coote return to Sydney immediately to spare expenses. Ern Bailey wired confirmation to Coote that the expedition was returning and would Coote go out and search for Lasseter?. Mystified and angry at Blakeley's apparent desertion of Lasseter, the only man who knew the location of the reef, Coote wired Sydney that he was willing, (perhaps eager in the light of his secret knowledge) to carry on the search for the prospector indefinitely, and would make arrangements as soon as he arrived in Alice Springs. He finally flew out of Oodnadatta on 24th September 1930. 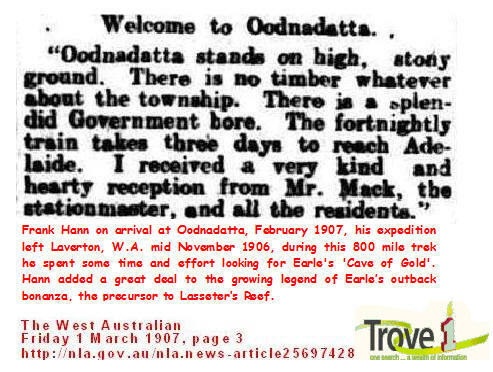 According to Coote, Lasseter made an attempt to relocate the reef in 1911, he got a party of men together and they left for parts north west from Oodnadatta. The expedition was short lived, discomforts of the track and lack of alcohol forced a return to the Transcontinental Hotel. The details of Lasseter's 1911 expedition are set out in entry, 297. YEAR. 1911. Four years after Lasseter allegedly passed through Oodnadatta, the South Australian Surveyor General, Mr. T. E. Day paid a visit to, "This little township, dumped down nowhere so to speak, right in the heart of the gibber country, does not impress one favourably as a holiday resort, although its climate is particularly bracing in the winter and even in summer, when during the day time the thermometer might register 120 Deg. in the water bag, the nights are as rule, comparatively cool. To see a region as desolate as can be imagined, nothing but gibbers as far as the eye can reach. It has been said of Oodnadatta that the devil made the place and even he was so disgusted with his work that he threw stones at it". Coote, E. H. Hell's Airport. 29,65,171,172. Finlayson, H. H. The Red Centre. 30,132. Madigan, C. T. Central Australia. 58-61. Kimber, R. G. Man from Arltunga.